Legend has it that yarrow (Achillea millefolium) was named after Achilles, the Greek mythical hero who used it to stop the bleeding in his soldiers' wounds. Popular in European folk medicine, yarrow contains flavonoids, plant-based chemicals that increase saliva and stomach acid to help improve digestion. Yarrow may also relax smooth muscle in the intestine and uterus, which can relieve stomach and menstrual cramps. Yarrow, a member of the aster family, is closely related to chrysanthemums and chamomile. It flourishes in a sunny and warm habitat, and is frequently found in meadows and along roadsides, as well as on dry, sunny slopes. It grows as a simple, upright, and hairy stem, usually under 3 feet. Yarrow blooms between June and September. The flowers are typically white, but either pink or pale purple flowers are common in mountain areas. The petals are densely arranged in flattened clusters, and the leaves look like feathers. The plant spreads rapidly. There is substantial genetic variation in the plant's beneficial properties. 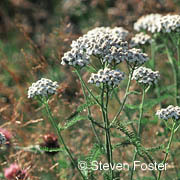 The flowers, leaves, and stems of the yarrow plant are used as medicine. Yarrow is collected while in bloom. There have been no studies to determine whether yarrow is safe for children, so it is not recommended for pediatric use. Talk to your child's health care provider before giving yarrow to a child. Ask your provider to help you determine a dose. The use of herbs is a time-honored approach to strengthening the body and treating disease. However, herbs can trigger side effects and interact with other herbs, supplements, or medications. For these reasons, you should take herbs with care, under the supervision of a health care provider. If you are allergic to plants in the aster family (chrysanthemums, daisies, and ragweed), you may be allergic to yarrow, either taken by mouth or applied to the skin. Yarrow may make your skin more sensitive to sunlight. Pregnant women should not take yarrow. Its ability to relax the smooth muscle of the uterus could cause miscarriage. At least one study found that yarrow was associated with reduced fetal weight in rats. Other studies have shown an increase in the percentage of abnormal sperm among male rats treated with yarrow extract. No studies have been done to know whether yarrow is safe in breastfeeding women. If you are nursing, talk to your health care provider before taking yarrow. Because of the potential for side effects and interactions with medications, you should only take dietary supplements under the supervision of a knowledgeable provider. High doses of yarrow may slow down blood clotting. If taken with medications that thin the blood, such as aspirin, clopidogrel (Plavix), and warfarin (Coumadin), it may raise the risk of bleeding. Yarrow may increase the amount of lithium in the body, leading to dangerous levels. Yarrow may lower blood pressure slightly, and could strengthen the effects of prescription drugs taken to lower blood pressure. Akkol EK, Koca U, Pesin I, Yilmazer D. Evaluation of the Wound Healing Potential of Achillea biebersteinii Afan. (Asteraceae) by in vivo Excision and Incision Models. Evid Based Complement Alternat Med. 2011;2011:474026. Boswell-Ruys CL, Ritchie HE, Brown-Woodman PD. Preliminary screening study of reproductive outcomes after exposure to yarrow in the pregnant rat. Birth Defects Res B Dev Reprod Toxicol. 2003;68(5):416-420. Cavalcanti AM, Baggio CH, Freitas CS, et al. Safety and antiulcer efficacy studies of Achillea millefolium L. after chronic treatment in Wistar rats. J Ethnopharmacol. 2006;107(2):277-284. Dalsenter PR, Cavalcanti AM, Andrade AJ, Araujo SL, Marques MC. Reproductive evaluation of aqueous crude extract of Achillea millefolium L. (Asteraceae) in Wistar rats. Reprod Toxicol. 2004;18(6):819-823. Ebrahimi M. Inter- and intra-specific genetic diversity of Iranian yarrow species Achillea santolina and Achillea tenuifolia based on ISSR and RAPD markers. Genet Mol Res. 2012;11(3):2855-2861. Final report on the safety assessment of Yarrow (Achillea millefolium) Extract. Int J Toxicol. 2001;20 Suppl 2:79-84. Review. Hausen BM. A 6-year experience with compositae mix. Am J Contact Dermat. 1996;7(2):94-99. Karamenderes C, Apaydin S. Antispasmodic effect of Achillea nobilis L. subsp. sipylea (O. Schwarz) Bassler on the rat isolated duodenum. J Ethnopharmacol. 2003;84(2-3):175-179. Kazemi M, Rostami H. Chemical composition and biological activities of Iranian Achillea wilhelmsii L. essential oil: a high effectiveness against Candida spp. and Escherichia strains. Nat Prod Res. 2015;29(3):286-288. Khan AU, Gilani AH. Blood pressure lowering, cardiovascular inhibitory and bronchodilatory actions of Achillea millefolium. Phytother Res. 2011;25(4):577-583. Nemeth E, Bernath J. Biological activities of yarrow species (Achillea spp.). Curr Pharm Des. 2008;14(29):3151-3167. Rakel D, ed. Integrative Medicine. 3rd ed. Philadelphia, PA; Elsevier Saunders; 2012. Rohloff J, Skagen EB, Steen AH, Iversen TH. Production of yarrow (Achillea millefolium L.) in Norway: essential oil content and quality. Agric Food Chem. 2000;48(12):6205-6209. Rotblatt M, Ziment I. Evidence-Based Herbal Medicine. Philadelphia, PA: Hanley & Belfus, Inc.; 2002:369-371. Stojanovic G, Radulovic N, Hashimoto T, Palic R. In vitro antimicrobial activity of extracts of four Achillea species: the composition of Achillea clavennae L. (Asteraceae) extract. J Ethnopharmacol. 2005;101(1-3):185-190. Van der Weijden GA, Timmer CJ, Timmerman MF, Reijerse E, Mantel MS, Van der Velden U. The effect of herbal extracts in an experimental mouthrinse on established plaque and gingivitis. J Clin Periodontol. 1998;25(5):3099-3410. White L, Mavor S. Kids, Herbs, Health. Loveland, CO: Interweave Press;1998:22, 43. Yaeesh S, Jamal Q, Khan AU, Gilani AH. Studies on hepatoprotective, antispasmodic and calcium antagonist activities of the aqueous-methanol extract of Achillea millefolium. Phytother Res. 2006;20:(7)546-551.